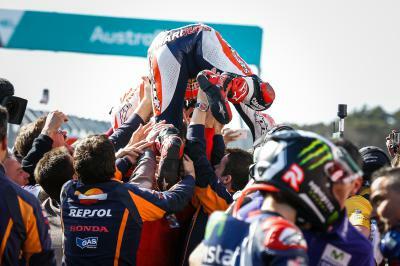 I’ve watched the Australian GP race three times already! With nineteen years of experience reporting on MotoGP™ for Motorcycle News, MotoGP™ Commentator Matthew Birt knows the Championship inside-out. 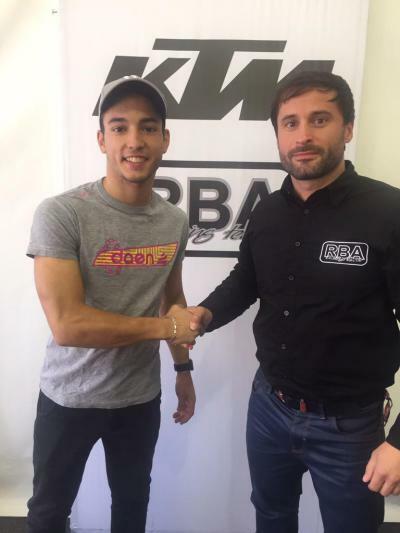 For the 2015 season he joins the motogp.com team to bring you exclusive news and opinion from inside the paddock. 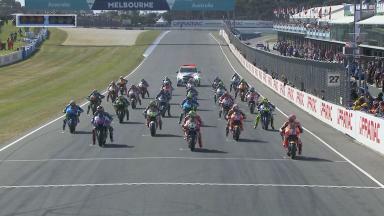 I’ve watched the epic Phillip Island MotoGP race three times already since Sunday. And even though I know exactly what happened, each time it gets to the last three laps my heart rate increases and I’m chewing my fingernails down to the bone. The last time I had that feeling was when Valentino Rossi and Jorge Lorenzo engaged in their titanic battle for the win at Catalunya in 2009. You know you’ve witnessed a truly mesmerising spectacle when Hollywood stars like Ewan McGregor instantly take to social media to express their admiration and emotion about a race that will be talked about for generations. 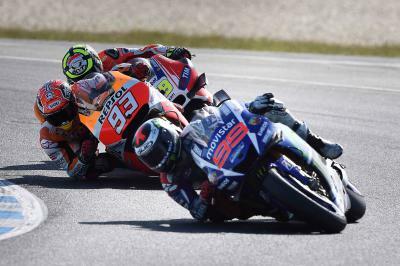 Marc Marquez, Jorge Lorenzo, Andrea Iannone and Rossi produced a breathless and fearless exhibition of close combat racing that not only reaffirmed why we all love MotoGP, but it showed just why our beloved sport is the greatest motorsport show on earth. We had the four fastest men in the world this year pushing themselves and their machinery to the absolute limit. It was breathtaking. It was crazy. It was nerve wracking. 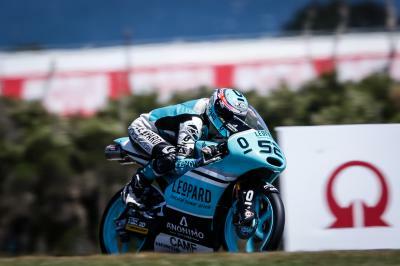 It was Moto3 style action being played out at over 200mph. Sublime riding skill meshed perfectly with controlled aggression. This was an exhilarating battle, but one that raged with respect and never threatened to turn dirty or dangerous. Over 50 overtakes were exchanged between the quartet. Some were effortless and executed by superior horsepower. Some were brilliantly conjured out of nothing. And one was so jaw-droppingly audacious that I doubt it will ever be repeated. I’ll be back to that later. I could write a book on those 27-laps alone, but will quickly assess the performance of the fantastic four at the front. 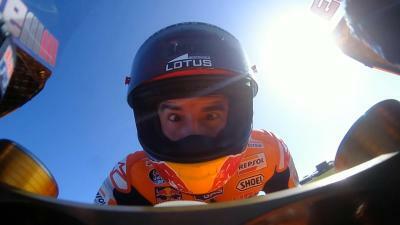 That last lap by Marquez was a fitting finale to all the drama that had gone before. He started the final lap almost 0.7s behind Lorenzo, and with Iannone to pass before he could even think about chasing down the Spaniard, it appeared game over. 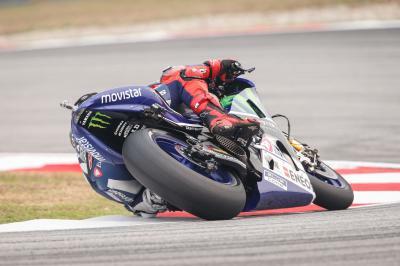 Lorenzo is the master of controlling a race at the front, so with clear track and a relatively comfortable lead, it seemed the contest for the win was over. Nobody though told Marquez. Only a great World Champion, and he is certainly that, could deliver such a phenomenal last lap. Too erratic and too error prone this year to keep his crown, Marquez has still shown flashes of genius in 2015, and his last lap was another moment of magic. Not only was his 1.29.280 the fastest lap of the race, but it was a whisker under a second quicker than anybody else on track! You won’t see a final lap delivered with such speed and composure, and even Marquez was at a loss to explain how he pulled it off. Lorenzo’s disappointment at relinquishing the lead so late quickly evaporated once he realised Iannone’s tenacity had broken Rossi’s resistance on the final lap. Defeat was easier to take knowing Iannone had taken three crucial points of Rossi, and he warmly embraced the Italian like a long lost brother on more than one occasion in Parc Ferme and the post race TV interview set. Iannone undoubtedly had the ride of his life in MotoGP. His performance was out of this world, and a few more repeats and it won’t be long before the alien club welcomes a fifth member. Iannone has gone from rough diamond to polished performer in 2015. The rebellious looking rock star has added consistency and focus to his game and has embraced the responsibility that comes with representing a major factory. He’s more ‘Mature Joe’ than ‘Maniac Joe’, having worked tirelessly behind the scenes to improve his English. He’s done his talking on the track too by finishing inside the top five in 12 races, including three podiums. On Sunday in Australia, he reminded the world just why he was given ‘The Maniac’ moniker. He survived an early scare when fatally striking a seagull on the turn drop down from Lukey Heights to turn 10. 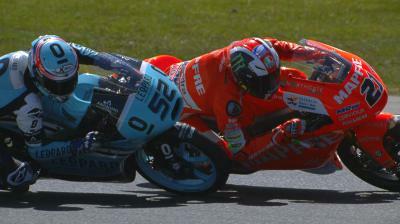 With just three laps to go, he killed two birds with one stone by pulling off a daring move that only someone with Iannone’s outrageous flair would even contemplate attempting. Marquez and Rossi are two of the most cold-blooded and aggressive riders we’ve ever seen. They are hard enough to pass on their own. So when Iannone swept majestically up the inside of both on lap 25, it was an attack so insane but so brilliantly implemented that you almost needed a slow motion replay to check your eyes hadn’t deceived you. I swear I’ll be the first man on Mars before I see anybody else carve up Rossi and Marquez again in the same corner. For the second time in three races, he had his nose blooded a little on the last lap and lost crucial points. In Aragon it was Pedrosa and now Iannone who dropped him off the podium for just the second time this season. Fourth seemed a scant reward for another awesome fight from Rossi. He never led the race but he certainly didn’t leave anything out on track, but once Iannone took third with just three corners remaining, not even Rossi could retaliate. The Ducati GP15 was a missile on the straight and at times it looked like Rossi and Lorenzo were on Moto2 bikes compared to Iannone. But to credit Iannone’s performance to engine performance would be a gross disservice to him. Rossi was more frustrated that an opportunity to beat Lorenzo had slipped from his grasp. The old timer had relished his starring role in a proper old style scrap, but he still saw his lead cut down to 11-points heading into Sepang this weekend. The temperature will soar this week in Malaysia and the heat is definitely on Rossi and Lorenzo. Fingers crossed my finger nails grow back in time! 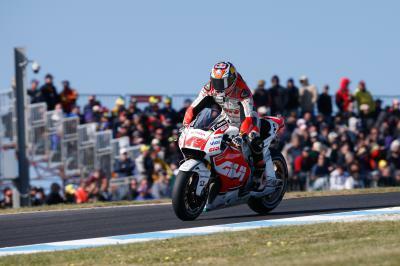 Jack Miller claims the Open victory at home with a measured ride in the Pramac Australian Motorcycle Grand Prix. 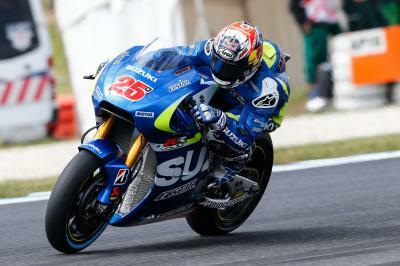 As with many riders, Aleix Espargaro encountered rear tyre issues that saw him struggle in the latter stages of the Australian GP. Cal Crutchlow secures seventh and top satellite in a hyper competitive Pramac Australian Motorcycle Grand Prix. The Pramac Australian Motorcycle Grand Prix saw Maverick Viñales produce one of his best races in 2015. A return to the points for Pol Espargaro in the Pramac Australian Motorcycle Grand Prix, but a lack of grip leaves him wanting more. Movement under acceleration costs Dani Pedrosa a chance to fight for victory at the Pramac Australian Motorcycle Grand Prix.